Fanetta heard about HOPE from one of her family members who attends First Waughtown Baptist Church. This church is adjacent to Belview Park, one of the first group of stops for the HOPE van. 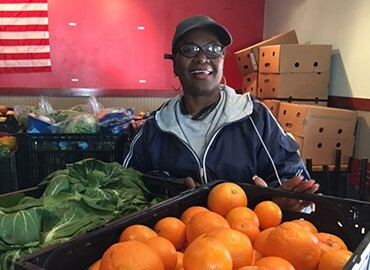 Fanetta knew of several children and families at her church, Kimberly Park Holiness, that could truly use HOPE’s Sunday lunches and produce bags. But Fanetta was not just looking for something from HOPE. She also wanted to reciprocate by giving her own time to HOPE. She is a firm believer in giving back to the community. Fanetta is a regular on Saturday mornings, usually showing up for the early shift to help make produce bags and staying through the second shift to help make lunches for children. She enjoys interacting the HOPE’s diverse group of volunteers, and we all, in turn, enjoy Fanetta’s enthusiasm and friendliness. Fanetta is married and has several grandchildren. She has introduced many of her grandkids – Kimani, Adia, Nailah, and Sekani- to HOPE, who can be found packing lunches side by side with Fanetta. If you come to help on Saturday mornings, you will probably meet Fanetta, one of our regular volunteers. Not only does she help on Saturdays, packing lunches for children and produce for adults, she also distributes some on Sundays with her church, Kimberly Park Holiness Church. Mother Teresa said, “Be the living expression of God’s kindness: kindness in your eyes, kindness in your smile.” That’s Fanetta!